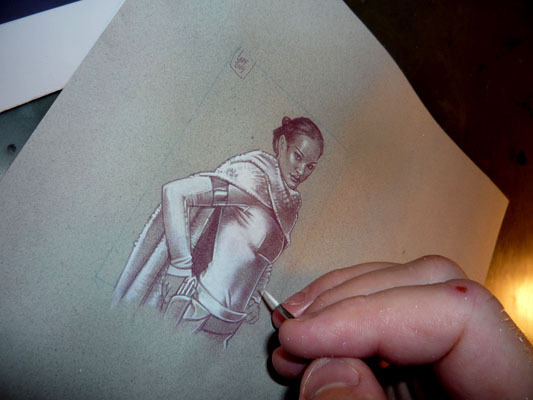 The new padme piece is almost done. I’m not going to put this one up on EBay, I’m just going to sell it here on my site. It should show up tomorrow afternoon sometime. I have sort of a love/hate relationship with EBay and right know its leaning more towards hate. They seem to want to make things really hard for sellers, and I don’t understand that. I pay them to have my store and I have a good seller rating, I feel like I deal with them fairly, but as a seller I don’t really get that same respect back. I’m talking about the EBay administration, not the customers that buy my cards, all of those people are awesome. Lately I’ve been thinking, why am I giving EBay so much money every month? So over the next week I’m going to expand the store here on my own site to include all of the prints, and probably most of the original art. Basically when you click a ‘Buy A LED Print’ link, you’ll be able to throw all the stuff you want into a cart at Paypal, and buy it directly through them. I’m also planning on doing some free card incentives to help everyone here get accustomed to the new system and then hopefully, I’ll be able to get EBay’s hand out of my pocket. I am still planning on continuing the EBay store but Its going to be a very diminished version of what it is know.